I like serving the carrots raw because they provide some textural contrast to the other ingredients in the soup. Feel free to cook it in the broth if you like softer carrots. In a pot, add 1 1/2 tablespoons of olive oil and heat the pot over medium heat. Add the ginger and garlic and cook for about 30 seconds. Add the miso paste and stir the paste constantly until the paste is no longer lumpy. A few tiny lumps is okay. Add the coriander and vegetable broth, cover the pot, increase the heat to medium-high, and bring the broth to boil. Reduce the heat to low and let the broth simmer as you finish cooking the other ingredients. Drain the tofu. Slice the tofu block in half, crosswise, so that you have 2 short and thick rectangles. Cut each half into 4 slices, crosswise, so that you will end up with 8 small rectangles. Slice each rectangle on the diagonal so that you end up with 16 rectangles. Mix the soy sauce with the five-spice powder and pour it over a non-stick pan. Take a piece of the tofu, and drag it around the soy sauce mixture. Flip the tofu over to cover all sides with soy sauce and leave the piece of tofu in the pan. Continue with the remaining pieces of tofu, until all the soy sauce has been absorbed by the tofu, and all the pieces are in the pan. Fry the tofu over medium heat for about 4 minutes, flipping halfway. It’s perfectly fine if the pan is dry at this point. Add 1 tablespoon of oil to the pan, and continue cooking the tofu for another 3 to 4 minutes, flipping it halfway. Turn off the heat and leave the tofu on the pan. Fill a large saucepan with water and bring it to boil. Add the dried noodles to the boiling water and cook according to package instructions. The noodles I used required about 6 minutes of cooking. Once the noodles are cooked, drain the noodles and run them under cold water. Taste the broth and add more salt, to taste. Raise the heat to medium-high and bring the broth to boil again. Add the bok choy and cook it for about 2 minutes, until green parts of the bok choy are vibrant green. If you want to cook the carrots, add them along with the bok choy. Divide the noodles in bowls and ladle broth over the noodles. Top with the vegetables and tofu, and garnish with scallions and sesame seeds. Serve immediately. *You might also see vacuum-sealed, slightly cooked udon noodles in the stores. If you are using those udon noodles, use 3 small packages of them. This recipe is meant to serve 2 people with 1 serving for leftovers. 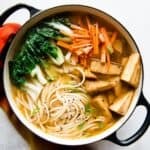 If you want this to serve 4 people, I would add another 2 to 4 ounces of dried noodles and another cup or two of broth. There is often a lot of dirt stuck around the stem of bok choy. Be sure to rinse the vegetables several times to get rid of the dirt.